Here's a tasty twist on the usual butter, salt and pepper on your baked potatoes. 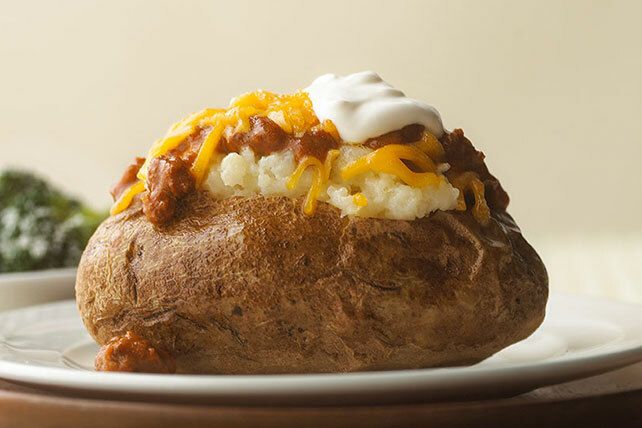 These are topped with a winning trifecta of chili, cheese and sour cream. Put potatoes on microwaveable plate. Prick in several places with fork. Microwave on HIGH 8 to 10 min. or until tender. Heat chili. Cut potatoes; top with chili, cheese and sour cream. Serve with steamed broccoli florets tossed with KRAFT Grated Parmesan Cheese. Substitute 1 pkg. (32 oz.) frozen French fried potatoes, cooked, for baked potatoes. Substitute CHEEZ WHIZ for shredded cheese.